Apparently, the media loves goats. We had three TV stations in our office yesterday to see these Ute goats destroying the BYU grass field installed in our office. Check out channel 4’s coverage and Fox 13’s coverage below, and the interviews of our CEO, Brock Blake, and President, Levi King (just know the video starts off with a commercial). Go here for Channel 2’s coverage on Fresh Living. 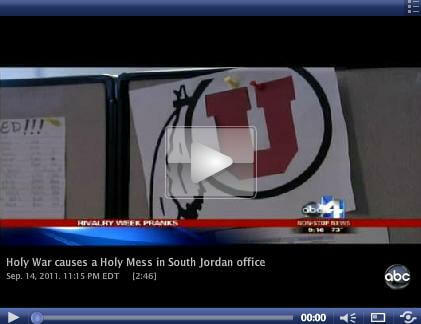 To see what led to this, read BYU-Utah Rivalry Is Alive at Lendio — 3 Years in a Row and Lendio Utes Strike Back and Lendio’s Final Rivalry Prank.